The new school year started four days ago in the occupied West Bank, and Israeli soldiers have fired tear gas and hurled stun grenades at Palestinian elementary school students on at least two occasions already. In the Nablus-area village of Burin, which is surrounded by illegal Jewish-only Israeli settlements, Israeli forces stormed an elementary school Wednesday, firing tear gas and stun grenades at students after a settler’s vehicle traveling nearby the school was allegedly hit with a rock thrown by a Palestinian youth. Many children were treated at the scene for tear-gas inhalation, reported Ma’an News Agency. One day earlier, Israeli forces in Hebron fired up to 15 tear gas canisters and five stun grenades at small children as they made their way to school Tuesday morning. Video of the attack — recorded and posted to YouTube by the International Solidarity Movement (ISM) — shows frightened schoolchildren, who look to be as young as five years old, running for cover with hands over their ears as Israeli soldiers weave in between buildings with rifles out, blanketing the children with suffocating plumes of tear gas smoke. You can watch footage of the assault at the top of this post. I was standing with my fellow ISM’er next to two young boys who were both under six-years-old. We saw a few teenagers run towards the checkpoint and throw stones; they then ran away very quickly. The soldiers then threw two stun grenades very close to us. We tried to comfort the two young boys when they [the stun grenades] exploded, but what could we say? They were both terrified. We walked with them down closer to their school and they began to run. At that moment, a tear gas grenade was fired and there were no children throwing stones. The smoke was thick and I began choking, it felt like I couldn’t breathe. I can’t imagine what this sensation would have been like for a child, and there were so many present. From there the situation just seemed to get worse, with so much tear gas in the air, children were unable to reach their schools. 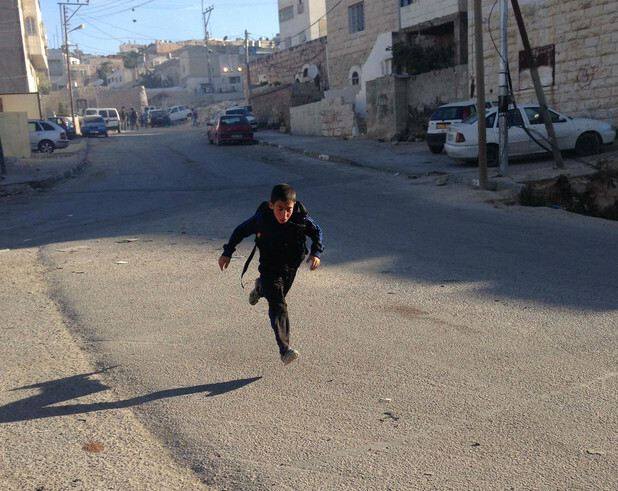 Israeli army attacks against defenseless Palestinian children traveling to school are disturbingly common. During the final month of the 2013-2014 school year, ISM documented 11 tear gas grenades and 13 stun grenades launched against Palestinian school kids as young as 4 years old. And that was just in Hebron alone. The school year in Gaza was scheduled to begin on 23 August but has been indefinitely postponed due to the overwhelming terror and destruction caused by Israeli attacks this summer that killed more than 500 children, orphaned at least 1,500 and damaged 220 schools, 22 of which were completely destroyed. Of the more than 3,000 children who were injured, around 1,000 have been left with lifelong disabilities, many of which require medical care that is unavailable in Gaza due to the crushing Israeli siege that has yet to be lifted. While the violence inflicted on children in the West Bank might pale in comparison, the root cause is the same. Whether in Gaza or Hebron, Palestinian children are under assault by a merciless Israeli war machine that deliberately targets them and their right to an education with absolute impunity. Sadists. What kind of people deliberately target small children walking to school? Why does the world allow this to happen without repercussions accruing to Israel for this mindless brutality? What is the point if not simply to terrorize children? How is this "defensive"? Why does the USA continue to fund this brutality toward children? How are we going to resolve this when the future citizens of Palestine have been taught to hate Israel, by the Israelis themselves. Clever tactics Netanyahu. Yaweh, no more than Allah or Jesus Christ, is not the solution, Jane. Look not to our stars but to ourselves -- and to those around us. There is nothing on that video to show who where the grenades and gas came from. Are you trying somehow to imply that the Palestinians are tear gassing their own children? Why not just say it? You are disgusting. Don't be obtuse. Any time the IDF is present, which they clearly are in this video, and brutality happens, there's no question who the guilty party is. And, besides, if Palestinians fired tear gas the next thing we would see on the video is a rage attack by the IDF and a bomb strike. There's no defense of Israel available on this video. And Anne Frank was really a German girl killed by Jews...right? Next we will hear Zionists claim maybe Jews DID bring the Holocaust on themselves because, after all, few of us were "there" at the death camps to prove otherwise. "There is nothing on that video to show who where the grenades and gas came from." About as relevant as the fact there is nothing in your gormless insinuation to show where your message came from. Further evidence of a morally regressive rogue state,gross abuser of human rights and routinely ignores international law and backed by the wolrds leading Psychopath the US ,who protects Izrael regardless what it does.As for Izraeli soldiers,the most cowardly in the wolrd kill defenceless men,women and children in the name of defending itself. You must understand, any opposition being more than six years old, and armed with stones, is beyond the ability of IDF troops to deal with! Armed to the teeth with the most lethal weapons in the world, but still feeling threatened by five and six year-olds. I don't understand how a mighty army could behave such a way. Nothing justifies such actions for stone being thrown onto a car!!! What a bully!!! And Israel and those supporting Israel wonders why the children grows up willing to fight and die for their freedom after being terrorized in such a manner. Who is the terrorist then!!! Please, we all need to get together and take those involved (including Obama) to court! We cannot stand by and let these murderers get away! Where are the children that the IDF kidnapped???? Please! I beg you! I support Palestinians. I want Israel out from Palestine. But my question is. What can I do? More I see this settlers,abusing the Palestinians, I get very angry, I am asking my self who gave this people all this power? Why the world is not saying anything. Where is Jordan,Saudi Arabia,Lebanon,Syria. Are they afraid from Israel? Is Israel controlling the world? Let me know what can I do so I can help. And our voices to be heard. Israel has nuclear weapons, is not above assassinating leaders who disagree with them and their families, and has the unquestioning, uncritical support of and a 3.2 billion a year 'contribution' to their military from the US. Why there is no action on this situation ? Why in god name they don't leave these innocent people's alone. Such cowards , every bad things they do there trying to show the world they defending them self, of what? School children.